Discussing the Greater Dallas Veterans Day Parade with Pat Teipel, Chair of the Greater Dallas Veterans Day Parade, and Joe Cordina, Chairman of the Greater Dallas Veterans Day Foundation. The Greater Dallas Veterans Day Parade takes place on Monday, November 12. To learn more, visit www.VetsDayinDallas.org. UPDATE: Due to the Weather, the Greater Dallas Veterans Day Parade has been canceled. The 2018 Parade Theme: "Commemorating the End of World War I, November 11, 1918," pays tribute to 100 years since the guns of World War I fell silent across Europe. Col. Ken Cordier, USAF (Ret.) and board member at Greater Dallas Veterans Foundation, will serve as Grand Marshall. Alexis Andres, Consul General of France, will be the keynote speaker. More than 100 military and veteran organizations participate each year. 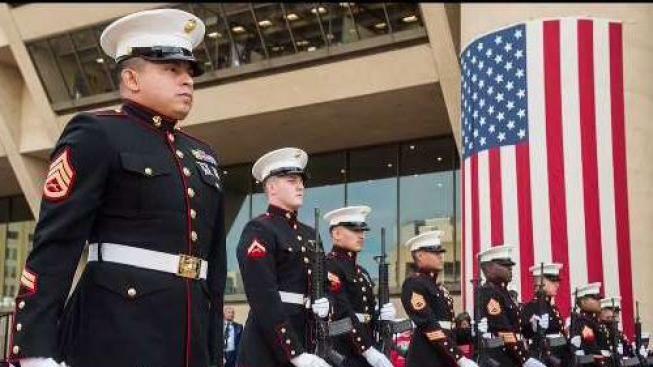 Military vehicles and equipment, veteran’s organizations, civic and corporate displays will be available for viewing at 9:30 a.m. in front of Dallas City Hall, 1500 Marilla Street. Come out and honor our military servicemen and women, past and present.